“You can imagine that with large protein complexes made from many different, smaller subunits there are many ways for them to be assembled. These can end up having quite similar masses while actually being different species with different biological functions. This is especially true with enzymes, proteins that mediate chemical reactions in the body, and membrane proteins that control a cell’s interactions with its environment,” explainsMichael Roukes, the Robert M. Abbey Professor of Physics, Applied Physics, and Bioengineering at Caltech and the co-corresponding author of a paper describing the technology that appeared March 30 in the online issue of the journal Nature Nanotechnology. With their devices, Roukes and his colleagues can measure the mass of an individual intact molecule. Each device—which is only a couple millionths of a meter in size or smaller—consists of a vibrating structure called a nanoelectromechanical system (NEMS) resonator. When a particle or molecule lands on the nanodevice, the added mass changes the frequency at which the structure vibrates, much like putting drops of solder on a guitar string would change the frequency of its vibration and resultant tone. The induced shifts in frequency provide information about the mass of the particle. But they also, as described in the new paper, can be used to determine the three-dimensional spatial distribution of the mass: i.e., the particle’s shape. “You can imagine situations where you don’t know exactly what you are looking for—where you are in discovery mode, and you are trying to figure out the body’s immune response to a particular pathogen, for example,” Roukes says. In these cases, the ability to carry out single-molecule detection and to get as many separate bits of information as possible about that individual molecule greatly improves the odds of making a unique identification. “We say that cancer begins often with a single aberrant cell, and what that means is that even though it might be one of a multiplicity of similar cells, there is something unique about the molecular composition of that one cell. With this technique, we potentially have a new tool to figure out what is unique about it,” he adds. So far, the new technique has been validated using particles of known sizes and shapes, such as polymer nanodroplets. Roukes and colleagues show that with today’s state-of-the-art nanodevices, the approach can provide molecular-scale resolution—that is, provide the ability to see the molecular subcomponents of individual, intact protein assemblies. The group’s current efforts are now focused on such explorations. 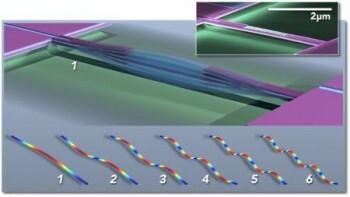 Scott Kelber, a former graduate student in the Roukes lab, is the other co-first author of the paper, titled “Inertial imaging with nanoelectromechanical systems.” Professor John Sader of the University of Melbourne, Australia, and a visiting associate in physics at Caltech, is the co-corresponding author. Additional coauthors are Cathal D. O’Connell and Paul Mulvaney of the University of Melbourne. The work was funded by a National Institutes of Health Director’s Pioneer award, a Caltech Kavli Nanoscience Institute Distinguished Visiting Professorship, the Fondation pour la Recherche et l’Enseignement Superieur in Paris, and the Australian Research Council grants scheme.